Dandies take a little snooze: band smirks their way through another sloppy psychedelic pop-fest. 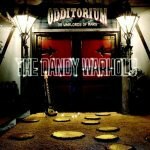 The Dandy Warhols' new album, Odditorium or Warlords of Mars, opens with a strange intro track from A&E host Bill Kurtis entitled "Colder Than the Coldest Winter Was Cold". It's meant to be a parody of the Dandies, treating them like world-famous 1950s rockers, with Kurtis quoting lead singer Courtney Taylor-Taylor as saying, "It's only rock and roll, but I think I like it". When I heard this, I expected something interesting from Odditorium of Warlords of Mars. Even if it wasn't really a concept album, maybe it would be a retro-rock departure for the band. But the second and third tracks, "Love Is the New Feel Awful" and "Easy" are both seven-minute-plus opuses of wispy space rock, and however catchy it may be, if it's not "Sad-eyed Lady of the Lowlands," keep it at four minutes, please. As the album stretches on, it turns out to be no one thing in particular, but instead a rather unfocused mish-mash of the Dandies' previous styles. The Dandy Warhols achieved a higher profile than they ever imagined last year with the release of the celebrated Sundance film Dig!, a documentary focused on the band's friendship with the volatile Brian Jonestown Massacre. The Dandies were the band releasing pop singles and signing with a major label, but the question remains: musically, who are the Dandy Warhols? Their two biggest singles include the biting "Not If You Were the Last Junkie On Earth" from 1997's Dandy Warhols Come Down and "Bohemian Like You", another sarcastic but more exuberant pop song from 2000's Thirteen Tales From Urban Bohemia. These straight pop songs, the former drenched in 1990s cynicism, do little to define a band with a cult following and a large catalog. Songs from Odditorium like the moody highlight "Everyone is Totally Insane" and "Holding Me Up", showcase the typical Dandies sound, but without any real spark. Once I realized Odditorium or Warlords of Mars was not going to be a cohesive album, I banked my hopes on another pop single as infectiously witty as "Bohemian Like You". "All the Money or the Simple Life Honey" comes close, with Taylor-Taylor finally using his cracked drawl with focused country-blues purpose. The song uses a familiar horn sound to catch the ear of listeners, and though it is enjoyable, it never really takes off. In a similar vein, "The New Country" would be a good Old 97s song, but on this album, the country stomper seems out of place. The discontinuity continues with the first single from the album, "Smoke It". At first it seems like a hit, until you realize that it already was: The Hives' "Hate To Say I Told You So." Taylor-Taylor adds a country feel, but that doesn't change the uncanny similarities between the riffs of the two songs and the megaphone vocals. Overall, the Dandies deserve credit for following their own path in an age of retro throwbacks. There are no formulas here, and that's a good thing, but one can't help but feel the lack of focus and discrimination it took to put together Odditorium or Warlords of Mars. The same psychedelic pop vibe lingers, but the Dandy Warhols can be sharper, tighter, and more interesting than this. "Hear me out for I was joyful once like everyone / Hear me out I must have changed", Taylor-Taylor sings on "Everyone Is Totally Insane". Change is good, and though the Dandies have already had their "Bohemian Like You", they still have the following and the talent to survive rock 'n' roll malaise.